US, 1979, 117 minutes, Colour. Michael Caine, Omar Sharif, Peter Ustinov, Rex Harrison, Beverley Johnson. Michael Caine had a spate of Boys' Own adventures in the '70s, and here spends the film chasing slave merchant Peter Ustinov across Africa by helicopter, bus and camel. The prologue highlights slave traffic in Africa in 1978 and shows how this is possible among Tuareg chiefs and wealthy society men of middle-eastern countries. However, the film settles for expected adventure ingredients and a shoot-'em-up finale that takes away from the opening solemn statements. Rex Harrison and William Holden appear as guest 'goodie' and Omar Sharif as a suave guest 'baddie'. It has the makings of an exciting social-minded adventure but contents itself with conventional and often negligible popularity. 1. Enjoyable popular adventure? Social adventure? How seriously was the film meant to be taken? Its themes? A reflection of social issues of the '70s? 2. The important of colour, Panavision, African and Middle-east locations? The score - with the romantic touch of the song with the final lyrics? 3. The Boys' Own adventure? The appeal of this kind of film? The strengths and weaknesses of the screenplay? The contrivance, the use of conventions? How authentic and realistic? How much from the cinema world of adventure? 4. The introduction to David and his wife? The African village, the World Health organisation and its work? Their skill with the Africans? Their marriage, love? Motives for working? The wife as the Ashanti? 5. David and Michael Caine's style? Love for his wife, reaction to her disappearance? The sullen and morose aspects of his character? The encounter with Brian Walker and his hostility and suspicions? The antagonism towards Sand~ ell? His grudging acceptance of their help? The experience of the pursuit especially in the helicopter, seeing his wife, his inability to shoot and his being the cause of Sandell's death? Brian Walker and the introduction to Malik? His summing him up and being summed up? His donning Arab clothes and learning to ride a camel? His pursuit, his motivation? The experience of the Arabs? The Tuareg chief and the encounter with the slave girl? The confrontation with the slave girl? The confrontation with the slavers and discovering they were the wrong ones? The searching out of Suleiman? The fight? His desperation for his wife and yet shooting Suleiman? The pursuit of the boat? The reunion with his wife? A hero exercising vindictive justice and vengeance? 6. His wife and her role as a United Nations doctor? Her American education and yet her love for the Africans? Her swimming and her capture? Being trapped in the slave caravan? The confrontation with Suleiman? Being repelled by the conditions? Her reaction to the boy being raped? The experience on the raft, seeing the helicopter? The trek through the desert, the suffering, the drinking water? Watching the boy exercise his witch doctor powers on the guard? Her escape and being pursued and almost killed? Her being drugged so she could be sold? Her confrontation with the prince? The melodramatics of the rescue? An attractive heroine? The emphasis on an inter-racial marriage? 7. Peter Ustinov as Suleiman? His style - credibility as a slaver? His capturing of the Africans, his ruthlessness? The ironic benign aspects of his character? His shooting of Sandell? His basic evil attitude - his allowing the guard to use the boy? Trying to sell his slaves? The encounter with the Tuareg chief? The fattening house? The shooting of the guard pursuing the girl? His humiliation of the slaves and of his underlings? His love for pearls, his presence at the pearl market? The confrontation with the prince and his being humiliated? The clash with Malik and with David and his seeming to escape death and suddenly being shot? Audience antipathy towards him? 8. Brian Walker and his presence in the East, his association against slavery, his helping of David? Guiding him towards Mallk? A Rex Harrison type? Sandell as the mercenary? The William Holden type? His help and his seemingly heroic death? 9. The portrait of Malik and his motivation for pursuing Suleiman, helping David, moving through the desert, the killing of the wrong slavers? The pearl market? Giving his word not to kill Suleiman? Finally helping David and dying for him? 10. 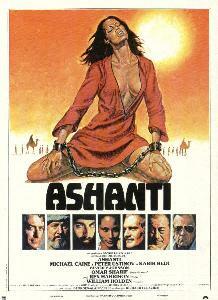 The film's visual presentation of slavery, the comment that this was real in the 1970s? The purposes of slavery? The selling of slaves to Tuareg chieftains and to the rich princes? The various agents along the way? Starving the slaves and then feeding them? The money to be made? The lack of detection? African police and their inability to stop the raids, halt caravans? African politics and border disputes preventing detection? The presentation of the wealthy princes and their buying slaves? 11. Omar Sharif as the prince, his willingness to buy slaves, his fear of being found out - and his behaviour on the ship? 12. How enjoyable an adventure, involvement in the chase structure of the film and its melodramatics, sympathy for the slaves? Moving through the various locations? Comment on the violence of the film, especially in the many deaths.